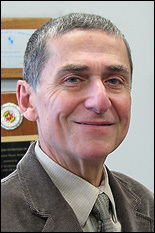 Professor Aris Christou was the Chairman of the University of Maryland, Materials Science and Nuclear Engineering Departments (until July 2003), and presently holds professorial appointments in the Department of Materials Science and Engineering and Mechanical Engineering. Prof. Christou received his Ph.D. in Materials Science from the University of Pennsylvania in 1971. He presently conducts research in compound semiconductor materials and process science, radiation effects in materials and devices, manufacturing science, and reliability. From 2000-2003, Dr. Christou was the Director of the NSF Center COEDIP, the Center of OptoElectronic Devices, Interconnects and Packaging. Dr. Christou was previously a Professor of Electronic Materials at Rutgers University, and research scientist at the Naval Research Laboratory. He has authored two books and has been the editor of three others. Dr. Christou has more than 150 publications in archival journals and 14 patents (including two pending), and has organized international conferences in GaAs devices, materials and reliability. Dr. Christou is a Fellow of the IEEE, a Fullbright Fellow, a recipient of the DoD-Berman Publication Awards, and an IEEE Guest Lecturer. Professor Christou was the 2004 recipient of the INEER Achievement Award (International Network for Engineering Education and Research) for achievements in international education and research in engineering, as well as the recipient of the 2007 ASM International Burgess Memorial Award "For his seminal scientific contributions in the field of electronic materials, packaging and devices." Professor Christou is a member of APS, ASM, TMS and MRS, was the past President of the Federation of Materials Societies from 2004-6, and is presently a member of the FMS Board of Trustees. Professor Christou’s technical contributions encompass the development of materials surface and interface science and methodologies for achieving reliable high frequency devices, optoelectronic devices and circuits. Professor Christou’s contributions established the critical relationships which exist between materials, materials surfaces and interfaces, process science, and reliability. His work has led to: reliable metallization gates, and hence to a reliable interconnect technology for compound semiconductor devices. His developed “Failure Physics” approach to the design and manufacture of compound semiconductor devices and circuits has been critical in achieving low cost-high yield commercial products. The achievement of a radiation –hard GaAs technology and enhanced package reliability as well as the establishment of the relationships between yield and reliability are directly attributed to his technical leadership. These contributions have ensured the availability of the industrial base for dual use products. Professor Christou’s contributions and technical leadership has paved the way for such products as satellite receive-transmit circuits, GPS systems and cellular communication. As a University Professor, Dr. Christou chaired the Department of Materials and Nuclear Engineering for ten years. The department included graduate programs in Reliability Engineering and Nuclear Engineering. This department was reorganized to form the present Materials Science and Engineering Department. As an educator in Materials Engineering, he has established a new undergraduate degree program, which spans electronic materials science and organic materials, and has led the expansion of that department as well as its successful reorganization. Professor Christou was awarded the Fullbright Fellowship in 1985, which he utilized to establish molecular beam epitaxy research programs in Greece. In 1986, he established reliability programs in both Italy and Greece. These programs were established under the auspice of the NATO Scientific Affairs Committee for Southern European Stability, a committee in which he was a member in 1986-1987. In 1981, he was awarded the UNESCO Scientific Affairs Service Commendation for his work in training international scientists in applying electron microprobe techniques to geological exploration. In 1987, he was awarded the University of Bologna Millenium Medal celebrating scholarly contributions during the 1000 year anniversary of the University. From 1978-1990, Professor Christou received five different awards for Outstanding Performance from the Navy crediting him with inventions in mixer detector diodes, thin film interconnects and for the development of reliable solid state phased array radar devices.